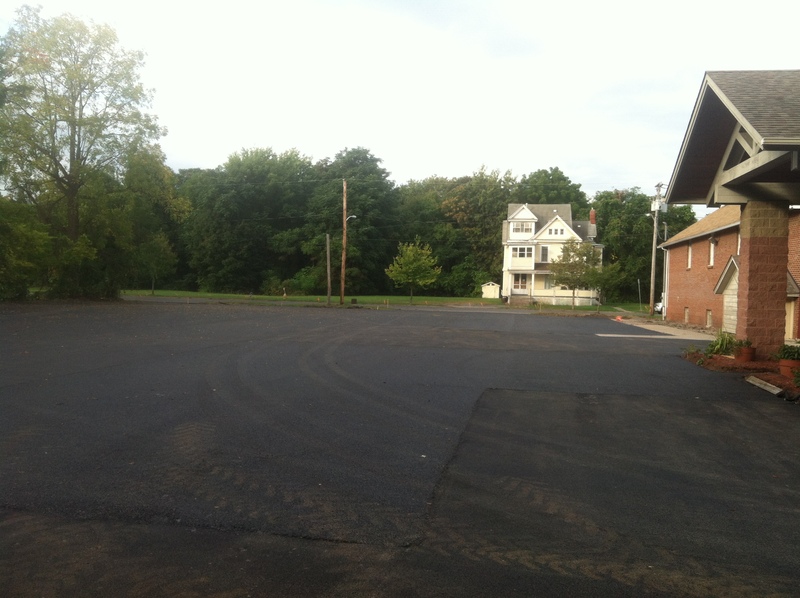 Green Infrastructure, porous asphalt parking lot completed at Tucker Missionary Baptist Church! In October 2015 construction was completed on the porous asphalt installation at Tucker Missionary Baptist Church, 515 Oakwood Avenue, Syracuse, New York designed by Natural Systems Engineering. The project involved construction of 12,000 sq ft of porous asphalt surface to manage runoff from approximately 70,000 sq ft of impervious lot and rooftop. The project was funded by Onondaga County’s award-winning “Save the Rain” program and will remove over 1.5 milion gal of stormwater per year from the City’s combined sewer system! The contractor was Ruston Paving Company (DeWitt, New York). This entry was posted in Green Infrastructure, Porous pavement, Stormwater Management, Uncategorized and tagged Central New York, Combined sewer overflows, engineering, green infrastructure, green stormwater infrastructure, permeable pavement, Porous Asphalt, porous pavement, Save the Rain, stormwater, Syracuse on October 30, 2015 by admin.